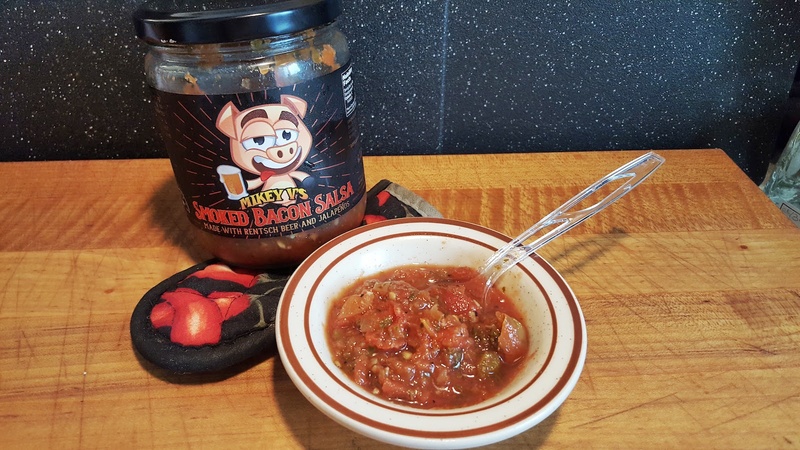 A huge hit at the latest NYC Hot Sauce Expo, Mikey V’s Smoked Bacon Salsa was a sell-out. But I managed to get a couple of jars just before they ran out. Ingredients: Tomatoes, Beer, Onions, Jalapeño peppers, Lime juice, Fresh garlic, Cilantro, Spices, Natural bacon flavoring, Pure cane sugar, Kosher salt, Black pepper, Spices, Cumin. If you look at those ingredients – that’s pretty much how the flavors come out. This delicious salsa has a distinct yet mild beer flavor coupled with fresh tasting onions and garlic. Jalapeños bring on the little heat that it offers. The smoked bacon flavor comes from a natural bacon flavoring ingredient. I appreciate this, as I wouldn’t want pieces of cooked bacon in my salsa. I’m ok with the flavor of it though, and I like a little natural smoke flavor if it’s in small doses. The pure cane sugar adds a nice sweetness to the overall flavor – I do like a sweet base in my salsas and sauces. 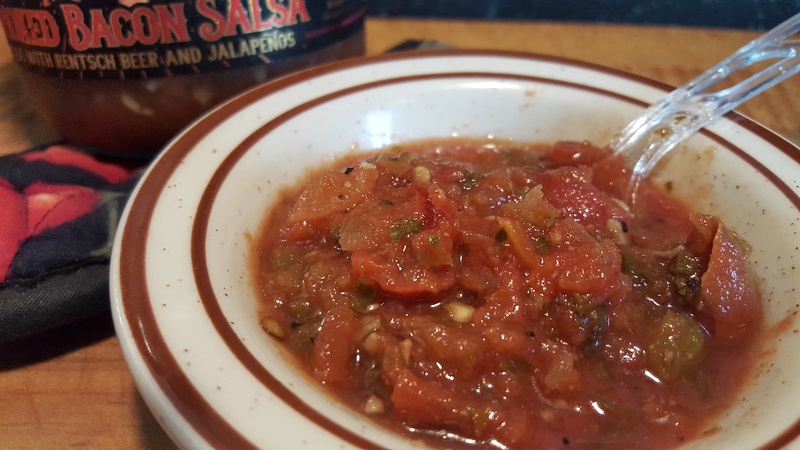 This is one of those “WOW” salsas that everyone will love! I couldn’t stop eating it as I write this review! Texture & Appearance: – Chunky. Lots of tomato, onion, garlic and jalapeño pieces. Heat Level: – Nice mild tingle. Just enough heat for everyone. Mikey V’s is also available to you lucky Texan’s all over the Austin and San Antonio areas. About: Based in Georgetown, Texas, Mikey V’s Foods is an award winning, Veteran owned, Texas based food company aimed at offering high quality, hot sauces, salsas, spicy pickles and jerky, using only the freshest all-natural ingredients with no artificial preservatives. We view ourselves as partners with our clients, and our community.